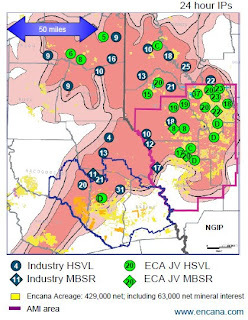 Haynesville Play: The Haynesville Shale Resource: So Where is That 37 MMcf/day IP EnCana Well? Instead of doing something useful and researching the teams in the NCAA basketball tournament to fill in my bracket, I spent my only free time this afternoon trying to figure out which well from the EnCana investor day presentation IP'd at 37 MMcf/day (24 hour peak rate). The Q&A session in Calgary yesterday seemed tame with only three or four questions for the U.S. division, and nobody asked the name of the boomer well. I'm guessing the analysts at the New York presentation on Thursday will be a little more direct and say, "name that well!" I'm going to hazard a guess. If you can believe the map, which is a very soft assumption since it is not a very technical map, I would assume the encircled 37 is in the Thorn Lake Field in Red River Parish. If that is the case, I only find two permitted but unreported EnCana wells in that area, the Edgar Cason 12H (#239984) and the Edgar Cason 13H (#240015). The type curve for the big well was not time oriented, so it is difficult to estimate how many days it has been flowing, but I eyeball that it has produced 750 MMcf to date. Guesstimating a flow rate of 28 MMcf/day, that would imply about 27 days of data. I don't know the date of the type curve, but I assume it is fairly recent. That would imply the well was completed about 30 to 45 days ago, +/- early February. From SONRIS (which is dated) and Baker Hughes rig reports, the Cason 12H well is in-test, while the 13H was still drilling as of January 29, 2010. Therefore, I guess the boomer is the Edgar Cason 12H #1. I hate to get all Hardy Boys on you, but I like a mystery as much as anybody else. But I reserve the right to be dead wrong, especially since I guessed that the map information was correct. Anybody else have an idea? Post a comment or email me (haynesvilleplay (at) gmail.com). Let's see if the boys in New York ask for specifics. I am going to guess the Red River-Bull Bayou Field but there are about 5 wells that would be a potential match. Or, it might also be a well that has already been completed. The Rex Young 21 (#239748 in S29/T14/R11), which had a reported IP of 25.7 MMcf/day. The 37 MM/day was a peak rate and the average rate might be in the upper 20's. It is a 20 frac stage. Can you check this from other data? The two longest laterals are Cason 13 (5,112') and Rex Young 20 (4,645'). According to DNR, as of 3/4/10 the well was perf'd and it was flowing as of 3/10. Assuming those dates are actual dates and not report dates, that wouldn't be enough time to get +/- 30 days of data. Rex Young 20 was perf'd 12/30/09 and turned to sales 1/6/10. I didn't hear the answer to the question during the New York presentation.